The finding, based on measuring a combination of proteins, makes it possible to accurately predict whether the patient will develop the disease. Multiple sclerosis is a chronic, neurodegenerative disease in which the patient's own immune system acts against their myelin, a substance that coats neurons and facilitates transmission of nerve impulses. This disease is the second-leading cause of neurological disability for persons between 20 and 40 years of age, following traffic accidents. It affects around 2 million individuals worldwide; 47,000 in Spain, and 7,000 in Catalonia. Although there is still no cure for multiple sclerosis yet, an early diagnosis is crucial to modify its evolution by slowing its progression. Scientists from the Proteomics Unit of the Centre for Genomic Regulation (CRG) and Pompeu Fabra University, led by Dr. Eduard Sabidó, along with researcher Manuel Comabella of the Multiple Sclerosis Center of Catalonia (Cemcat), the Neuroimmunology Unit of the Vall d'Hebron Research Institute (VHIR), have just published a study in Molecular and Cellular Proteomics proposing a novel method for early multiple sclerosis diagnosis based on detecting and quantifying a combination of proteins in the cerebrospinal fluid. In the majority of patients, disease initiates with an episode of neurological disorders called the Clinically Isolated Syndrome. Nonetheless, not everyone who experiences this syndrome develops the disease. The work of the CRG and VHIR researchers is focused on these cases, making it possible to discriminate and predict which of these patients will develop multiple sclerosis. “Being able to know if there is a high risk of developing the disease will allow us to follow these patients from early on, and thus, delay progression of the disease and its disabling effects on them,” states Dr. Comabella, researcher at Cemcat, VHIR's Clinical Neuroimmunology Unit. Multiple sclerosis is difficult to diagnose. Following neurological examination by a specialist, different tests can be run, such as a cerebrospinal fluid analysis, and cerebral magnetic resonance. Nevertheless, these tests are not always conclusive. In their work, the scientists have used mass spectrometry to detect a set of relevant proteins in the cerebrospinal fluid of a high number of patients. After analyzing each of the samples from this study, the researchers have identified the proteins that can predict the risk of developing multiple sclerosis. With these data they have also built a statistical model that, according to the abundance of these proteins in the cerebrospinal fluid, makes it possible to assign the probability of suffering the disease to each patient. “The use of advanced proteomics technology is becoming more relevant in clinical research, specifically, in diagnostics. 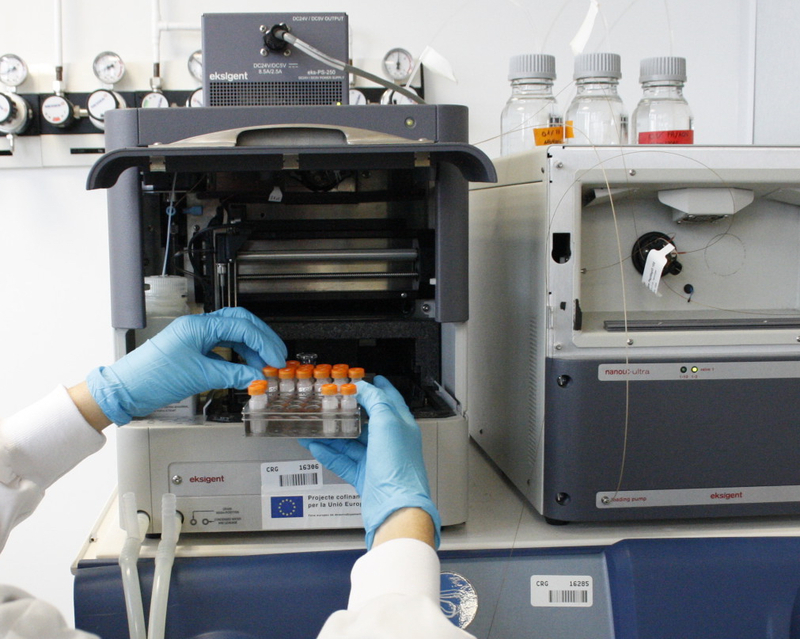 This is a clear example of the importance of cooperation between clinical and basic researchers to advance in knowledge and improve people's lives,” states Dr. Eva Borràs of the CRG and UPF Proteomics Unit, and one of the main authors of the study. This work has received backing from the Ministry of Economy and Competitiveness, the Spanish Multiple Sclerosis Network, the Government of Catalonia and the European Comission through the European Regional Development Fund (ERDF).